My favourite spice is without doubt cinnamon. I love the warm spicy taste, and the fact that when the weather gets cooler its popularity increases. 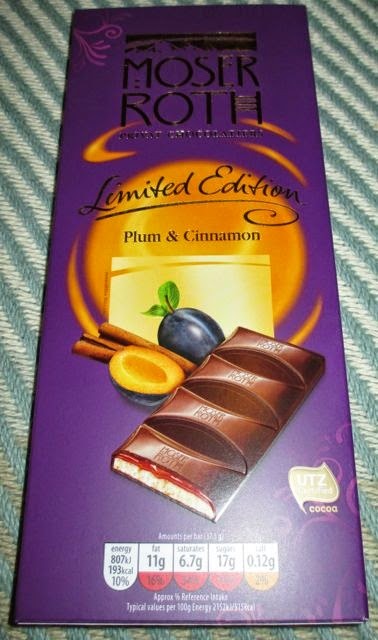 Right on schedule then Aldi have a new bar from Moser Roth flavoured with both plum and cinnamon. Although there isn’t a hint of holly on the packet, it did without question feel a little Christmassy. Inside the box are five individually wrapped bars, perfect for portion control. I unwrapped the first bar and was met with pieces of milk chocolate, inside of which was a layer white chocolate mousse and a plum and cinnamon jam. The jam layer wasn’t think, it oozed when I bit a piece in half and came dangerously close to spilling out. The flavours together worked very well. I loved the warm spice of cinnamon and the sweet plum, with the creamy chocolate tastes. It reminded me of Christmas pudding covered in custard, lots of flavour, a sweetness over load, but the spices holding it all together. As I much as I loved this bar and its spicy fruity taste, when my mum tried one she had a different reaction. She the bar was to sweet and as such a bit lost on her. I do have a self confessed sweet tooth and a love of cinnamon which clearly influenced my opinion, but perhaps this isn’t one for everyone. I shall be stocking up next week though and making the most of cinnamon’s regained popularity. I tried this bar and it's fantastic! Did they have the Apple Strudel and Pear variants too? The apple strudel one is amazing, worth buying if you spot it next time!